It has snowed all night and into the morning. The wind makes it look even more fierce outside as it whips the snow from the rooftops and into the street. I have also discovered that the windows in my room leak a good deal of cold air, so much so that I can see my breath, even near the fire. Mrs. Gamble and the servants have decorated the house with festive greens on every mantle, and a Kissing Bough hung beneath the doorway that leads into the Parlour. 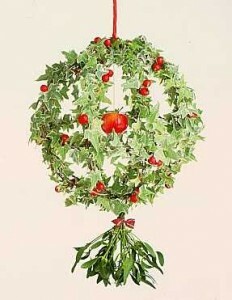 Their Bough is constructed of an abundance of holly and ivy with spiced apples in the center. Beneath it hangs a great patch of mistletoe. The entire thing is hung with a thick red ribbon. I have been caught beneath it twice this day by Mrs. Gamble who gaily kissed me on the cheeks. And once, this afternoon, Mr. Gamble and I encountered one another beneath it. Feeling quite festive, we danced a jig together, much in the manner of when we served aboard the Zealous in warmer climates. His wife and children laughed and applauded our efforts. Just before dinner I was forced to disarm Master John when he lunged at me in the hall with his sword. I stepped to the side to avoid his thrust, then grabbed his arm and twisted until he released the weapon with a great clatter upon the floor. He was quite taken aback by the fact that I had been able to get ahold of him with such force. "I have no desire to have you puncture my good jacket boy. Do not point your toy at me again." scolded I with a great frown.